Each morning we rise and hurry on our way to attend to our unattended busyness. We press and push down the road of life with all the rest not realizing we travel a road that never leads to rest. But we feel pressured and so on we press. Pressing urgently down this broad way. We have no reason for the press. In fact, we have no Great Reason at all. So we simply give in to Unreasonable’s pressure for more when we already have so much more than most. If doubts in our heart every sound, all we need do is look around. Everyone we know is on this way and so we convince ourselves and glibly say that good company is what really matters at the end of the day. It’s a false sense of security. But, after all, lies can be as equally comforting as the truth if we look to our feelings for the proof. Then, one glorious day, by unspeakable grace, we encounter a Truth-teller who speaks of another Way. It is a narrow Way, unknown to the many. It is a Way that begins at Death-to-Self and ends in Life-to-God. It begins with today-loss and ends in forever-gain. The Way beckons us calmly to embark. No pressure, no press. Just heavenly whispers of a higher mark. It seems unnatural, almost supernatural to walk His Way. Yet something about it stirs deep in our soul and resonates quietly at the core. 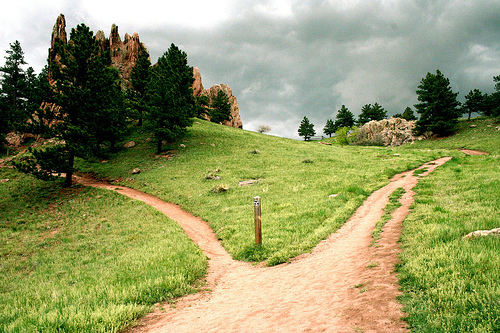 As we turn in ignorance and unbelief from the Way of Peace and choose instead the familiar path of pressure. Without the Truth to guide us we navigate our hopes and dreams around shiny little pieces of nothingness. Twinkling way-points on the road to Emptiness and Nowhere. Tragically, our doubt and worry causes our view of things to grow narrow. We get tunnel vision on the broad way and mistake our narrow view for a narrow way. The farther we travel, the less we see. The less we see the more convinced we tend to be — that this is the way, the only way. Our limited vision and dulled hearts turn an epic journey into a daily grind where Jesus becomes more of a topic of discussion than a traveling companion. So be mindful of your way for there will come a Day when the path we choose daily will end in our eternal destiny. I like this one, it reads the best for me.